If you are a fan of Charlotte's two highest-profile pro teams, you have to be desperate for a win right about now. The Carolina Panthers (3-7-1) haven't won since Oct.5th and have lost five games in a row. The Charlotte Hornets (4-11) haven't won since Nov.14th and have lost six games in a row entering Wednesday night's home game against Portland. After a banner season last year, when both teams made the playoffs, things have gone very sour. And yet both teams are far from out of the playoff picture -- the Panthers because the NFC South is so bad, and the Hornets because it's so early and they also are in the right conference (the Eastern, where only five of 15 teams were above .500 Tuesday morning). 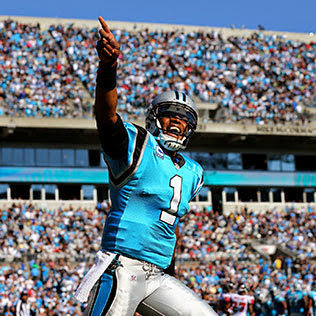 The Panthers just finished up their most successful Sunday in more than a month. They had a bye, and thus managed not to lose. In the meantime, New Orleans and Atlanta both lost, leaving Carolina only a half-game back in the South behind those two 4-7 squads. A win against Minnesota -- the team that Carolina beat to turn the tide in 2013 -- would at least make December interesting. 1) The early returns on Lance Stephenson have not been good. Coach Steve Clifford again benched Stephenson for the fourth quarter of the 113-92 loss to the L.A. Clippers. Stephenson shot poorly and dribbled too much, and so Brian Roberts and Gary Neal got his minutes. Stephenson is no savior. That has certainly been established. But he can do a lot of things pretty well (sometimes). One thing he rarely can do, though -- hit an open jumper. And he has got to buy into moving the ball on offense more quickly. 2) Marvin Williams is no Josh McRoberts. Williams can hit an open jumper -- sometimes -- but he is not a connector like McRoberts was. Few can pass like McRoberts, but have you noticed that Williams also never gets to the free-throw line? He does not drive the ball effectively at all. In 15 games this season, Williams has shot exactly two free throws. 3) Cody Zeller is getting better. Zeller still gets bumped around by bigger guys, but at least he's not hesitating as often to use his quickness. He had 17 points Monday and guarded Blake Griffin more effectively than Williams, although really neither one of them had much of a chance. 4) The Hornets really miss the injured Michael Kidd-Gilchrist -- their defensive stopper. While the Hornets' offense has been sporadic, the team has had even more trouble guarding people. That's why Charlotte's losing streak includes losses by 25, 27 and 21 points. Like the Panthers, the Hornets just don't play defense well enough right now. Finally, someone the Carolina Panthers can actually beat. The Atlanta Falcons and the Panthers have both won a total of three games this season, and somehow that hasn't knocked them out of contention in the NFC South, also known as the "Misery loves company" division. The Panthers have a number of players -- quarterback Cam Newton and defensive end Charles Johnson being two prime examples -- who take a special joy in beating the Falcons because of their own Georgia roots. They did so twice last season (this picture of Newton comes from one of those wins). The Falcons, though, have won a lot more recently than Carolina. They beat Tampa Bay a week ago. The Panthers haven't won since Oct.5th. It's been so long since Carolina won that a spacecraft landed on top of a comet in the meantime. Yes, we can land a spacecraft on a comet, but we still can't teach the Panthers' defensive backs to turn their heads when the ball is coming. -- If both quarterbacks have 250-300 yard days and throw for multiple touchdowns, I won't be a bit surprised. Both of these pass defenses have all sorts of problems. -- The ugliest statistic associated with the Panthers is also one of the simplest -- they have given up 281 points this season after giving up only 241 all last year. That's an average of 28.1 points per game. In retrospect, the most telling game the Panthers have played may have been that 37-37 tie against Cincinnati. The Bengals scored those 37 points, remember, without wide receiver A.J. Green. -- Want to talk more about the Panthers? I will be at the Myers Park Public Library on Tuesday from 6-7 p.m. to talk about the team, answer questions and tell some of my favorite stories after covering the club for the past 20 seasons. It's free. Join us. Pre-registration is encouraged here. -- Prediction time. I am 6-3-1 picking the Panthers' outcome this season after nailing the team's loss to Philadelphia last Monday night. This one, I believe, will be a shootout that turn outs better. My pick: Carolina 31, Atlanta 28. Unless you have some morbid curiosity, you probably do not want to know these eight numbers in the wake of Carolina's 45-21 loss to Philadelphia Monday night. .006 -- If Carolina had won Monday night, this would have been the Panthers' percentage-point lead over New Orleans (4-5). Yes, as badly as the Panthers have played for a month, one win would have put them back in first place in the NFC South. Instead, at 3-6-1 after this embarrassment, they are barely hanging onto second and will go to third if they lose to Atlanta at home Sunday. 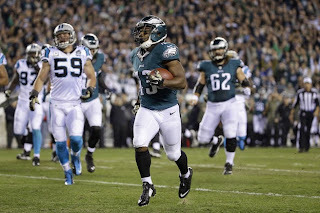 0 -- Number of recovered fumbles plus the number of interceptions for Panther linebacker Luke Kuechly this season (shown above, in the distance on Darren Sproles' first TD). 1-6-1 -- Panthers' record in the last eight games after a 2-0 start. 5 -- Panther turnovers, including two in the first three plays. Cam Newton had four of them -- a lost fumble and three interceptions (one was a pick-six). The Eagles had zero turnovers. 9 -- Sacks of Cam Newton, which tied the most sacks allowed in Carolina history. Frank Reich, who was a whole lot more immobile than Newton, was sacked nine times in the first game in franchise history in 1995 (but that one went into overtime). 10 -- In 24 carries by the "Double Trouble" tandem of DeAngelo Williams and Jonathan Stewart, that was the longest gain. The two combined for a paltry 2.8 rushing average. 10-for-20 -- This was the Panthers' third-down efficiency on offense, good for a very respectable 50 percent. It speaks to the fact that the Eagles defense can be had -- by a better team. 332 -- Yards passed for by Philadelphia backup quarterback Mark Sanchez, who was helped by the fact he was only sacked once and often had receivers running 5-10 yards free. Let's talk a little bit about the lack of explosive plays from Carolina's receivers, because that's one of the reasons this team struggles so much getting the ball into the end zone. Here's a disturbing statistic for you Panther fans. Philadelphia's Jeremy Maclin has five catches of 50-plus yards in 2014 -- by himself! The Panthers' entire team has one (Kelvin Benjamin's 51-yarder in the loss to Seattle, which is pictured here). This is where the departure of Ted Ginn Jr. and Brandon LaFell has really hurt Carolina. Those two weren't as consistent catching the ball as Steve Smith, but they would rip off a 50-yard play every now and then. And Jerricho Cotchery, the Panthers' other starter at wide receiver? He does have a 47-yard reception -- after the game was decided against New Orleans -- but he has not scored a touchdown all year. The Panthers' third wideout in most situations, Jason Avant, has only one TD. Carolina simply isn't getting enough production from any receiver besides Benjamin. Opponents have figured out that if they pay a lot of attention to Benjamin and Greg Olsen, it's very hard for Carolina to find anyone else to hurt them. -- Want to talk Panthers with me? 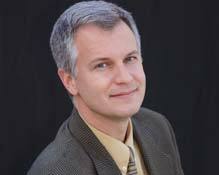 I will be appearing at the Myers Park Public Library on Tues., Nov.18th at 6 p.m. for a free talk. I will also have copies of my book "100 Things Panther Fans Should Know & Do Before They Die" available for purchase, but you don't have to buy a book to come join the conversation. You can sign up in advance right here -- pre-registration is encouraged -- or just show up that evening. -- Here's something I didn't know about the Eagles until the past few days: They have an official offseason basketball squad that plays in charity events. These used to be fairly common in the NFL -- when I covered the Miami Dolphins in the early 1990s, they had one for awhile -- but dwindled out because of the injury risk. The Panthers have never had an official team (although Greg Hardy once claimed he could beat LeBron James in a one-on-one game). You know who holds the Eagles' all-time record for most points in a single offseason basketball game? Maclin, with 50 points. -- You can bet Darren Sproles will have at least one huge play against the Panthers Monday night. He was a thorn in their side for years in New Orleans and always plays well when he sees black and blue. -- Prediction time. I misfired on picking Carolina to win against New Orleans, which dropped my record for the year to 5-3-1. Mark Sanchez will make a few mistakes as quarterback for the Eagles and I think Cam Newton is due for a good game. 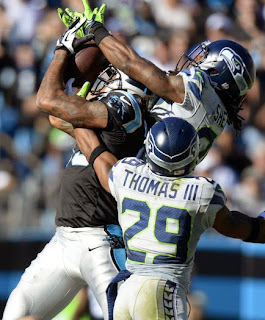 But ultimately I just don't see the Panthers' defensive secondary holding up against that frantic Chip Kelly offense. My pick: Philadelphia 31, Carolina 20. At a time of year when NASCAR races are often an afterthought, the sport is certainly getting some attention. The latest comes after the crews of Brad Keselowski and Jeff Gordon brawled on pit road Sunday after the two drivers collided just before the end of the race in Fort Worth, Texas, knocking Gordon out of contention to win and out of first place in the points standings, too. It was the second time in three weeks that Keselowski (on the far right in this picture with the white cap on) was involved in a skirmish. It happened at Charlotte Motor Speedway, too, on Oct.11th -- and it proved two things to me. 1) Keselowski has gone too far. When you've got basically everyone in the garage mad at you -- and you have had the normally even-tempered Jeff Gordon and Matt Kenseth both try to fight you in less than a month -- you're not doing something right. There's a difference between driving aggressively and driving recklessly, and Keselowski has veered too much toward the latter. He needs to rein himself in (see video of Sunday's incident here). He has become the new bad boy of NASCAR, but more in a Kyle Busch kind of way rather than the Dale Earnhardt kind of way. That's not good. Gordon, the four-time NASCAR champion, was hopping mad in a post-race interview Sunday. He called Keselowski a "dip----" and also said: "The way he races, I don't know how he's ever won a championship. That's why everyone's fighting him and running him down." Keselowski -- who like Gordon was bleeding slightly after the confrontation -- said afterward he was just racing hard and wouldn't change his style. The push Kevin Harvick gave Keselowski that started a scuffle that otherwise looked like it was about to peter out was totally out of line and should result in one of the many fines that will be handed out due to this altercation. What was Harvick doing in there anyway? But it was also a sign of what people think of Keselowski in the garage right now. 2) NASCAR's new format is working. The old Chase for the Sprint Cup was basically another points race -- just a shorter, 10-race one that bunched the field of Chase drivers but still awarded consistency above all else and never officially eliminated anyone. By the last race, in Homestead, things often were anti-climactic. But the "win or else" mentality that has pervaded this Chase is happening because that is the only way to assure advancement into the next round. I think it works better than any previous incarnation of the Chase, and there have been a lot of them since NASCAR instituted its playoff system in 2004. Drivers are eliminated four a time every three races for the first nine races of the Chase. And so there's much more of a tendency to take chances, which is generally good for the race fan (or the casual sports fan whose attention is mostly being taken over by the NFL and, more specifically, his fantasy football team). I also don't think there's any way Keselowski is going to win another title this year, although he remains in the final eight going into the next-to-last race at Phoenix Sunday (which will then cut the field to a final four). You still need cooperation among your fellow drivers in this sport. And Keselowski is not going to get very much of that. Ron Rivera is wrong on this one. 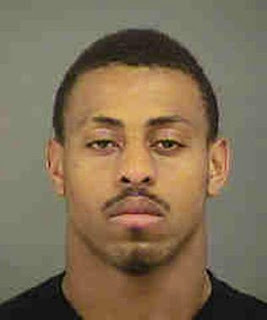 It is only natural for Carolina's head coach to want Greg Hardy back on the field. Rivera is a good man who has a lot more balanced worldview than most football coaches. But at heart, he is first and foremost a football coach. Rivera is paid to win games, and right now he isn't winning them. The Carolina Panthers are 2-5-1 since Hardy stepped off the field this season due to domestic violence charges. The star defensive end was placed on a paid leave of absence before Carolina's third game (he played in Week 1, then was deactivated in Week 2). Now it looks like (although it hasn't been made official) that his jury trial won't start Nov.17 as scheduled and will instead be postponed until after the season. Rivera thinks that if the trial is postponed, Hardy in essence will have already served his time and should be able to play. But there's really no new evidence and no compelling reason for the NFL to reinstate Hardy and let him play now as opposed to what we knew two months ago. He should continue to sit. His court date may ultimately change, yes, but that is the way court dates often work. Remember, at one point while Hardy was still playing, Hardy's people were hoping for exactly this same scenario -- that a crowded docket would push the trial back into 2015, thus assuring that Hardy could play the whole season for Carolina. Instead, it has gone the other way. Hardy put himself in this situation. The fact that his was the first real domestic violence case after the Ray Rice punch video -- that was bad timing. The court case being pushed back? Again, bad timing. But there would be no bad timing had there been no incident in the first place, and if a judge had not already found Hardy guilty in July of assaulting a female and communicating threats in connection with the May 13 confrontation with his former girlfriend. (Hardy appealed that conviction and asked for the full jury trial to which he is entitled). The Panthers are the ones who have come out the worst on this. They are paying Hardy a whopping $13.1 million as their franchise player this season -- $770,000 every week during the season -- and all they have gotten for that so far is one sack and a mountain of bad publicity. It is understandable that the team's coach would want to get more out of the team's investment. But ultimately, not enough has changed to warrant Hardy's return.